Gourmet gift baskets, relaxation remedies, educational toys and glassware. Hawaiian flowers shipped nationwide. Offers tropical flower bouquets, Hawaiian flower lei, and live orchid plants. Antonias Flowers produces the fragrances Tiempe Passate, Floret, and Antonias Flowers. Inspired by flowers and other natural sources, Antonia was the first to use 'living flower' technology. Flower growers cooperative ships premium protea and tropical flowers direct from Maui flower farms to the customer. Tropical Hawaiian flower farm. Offers exotic floral arrangements, care guide, and flower descriptions. Secure shopping is available. Flower farm offers fresh flowers and dried baskets, wreaths and arrangements of Maui grown protea shipped direct. Includes catalog. Victorian pressed flower pictures in pewter frames and pressed wedding flower invitation keepsakes. Sales of tuberose flower bulbs and hymenocallis (spider lily flower bulbs) worldwide. Drawings and pictures of flower fairies and fairy flowers by illustrators Natalia Pierandrei and Myrea Pettit. Artist profiles and links. Offers wreaths, table arrangements, swags, custom designs featuring dried flowers. Also freeze dried and preserved flowers and greenery. Flower fairies and angels created with water color and pressed flowers in vibrant colors, adorn greeting cards with a bouquet of colors. Pressed flowers, foliage, information, projects, a searchable reference database, pressed flower forum and floral art and crafts resources. Flower cutting canister used to hold flowers being taken from the garden. Offering comprehensive formulas made from Starflower essences, Flower Essence Society-Services, Bach Flower Remedies, and other varieties. Also flower essence training. Fresh flowers, arrangements, and plants delivered. Source of flowers, stickers, supplies and gift items. Florist shop with online ordering for local and worldwide delivery of flowers. Offers a variety of flowers, presses, and beveled glass arrangements. Flower delivery service, located in Cottesloe, Western Australia. Hawaiian flower essences, made from Kauai flowers in the Bach tradition. Offering flower presses in a variety sizes and peyote stitch beadling dolls. Copyrighted real flower jewelry designs using fresh flowers, silver, and gemstones. Pressed flowers, greenery and fall leaves, notecards, flower stickers and seals. Offers Hawaiian gifts, gift baskets, tropical flowers and fresh flower leis. Offers seed selections of rare, old-fashioned flower varieties. Send flowers from traditional through to up-market flower & gift basket designs. Located in Perth. Features roses and seasonal cut flowers for shipping nationally, from its Denver location. Unique flower arrangements for weddings, offices, and special events. Located in Cincinnati, Ohio. Flower designs utilizing exotic and rare blooms in combination with more traditional flowers. Local and out of area delivery. If the business hours of The Gift Isle in may vary on holidays like Valentine’s Day, Washington’s Birthday, St. Patrick’s Day, Easter, Easter eve and Mother’s day. We display standard opening hours and price ranges in our profile site. We recommend to check out growerflowers.com/ for further information. 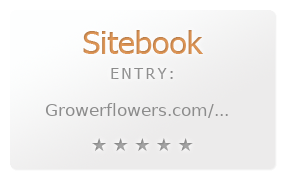 You can also search for Alternatives for growerflowers.com/ on our Review Site Sitebook.org All trademarks are the property of their respective owners. If we should delete this entry, please send us a short E-Mail.